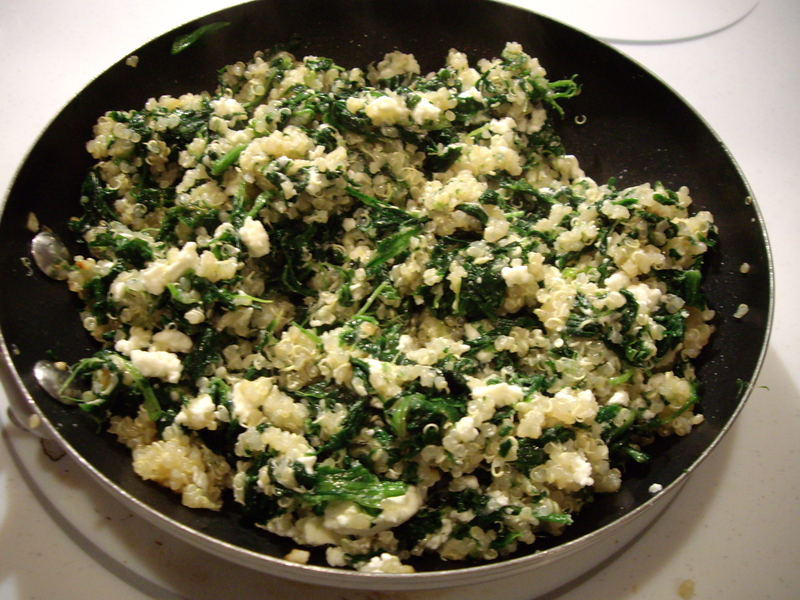 Quinoa with Spinach and Feta Cheese | What's Cooking at the Genua's? Lately I’ve read many recipes with couscous and quinoa (keen-wa). I found one today that is very easy to make and sounds really good. I am going to try and make it tonight and I will report back on it. The recipe calls for fresh spinach but if you don’t have fresh on hand use frozen, just make sure you thaw it good and squeeze out the extra liquid. You can also add chopped tomato (regular or even sun-dried!). Be brave, experiment. Remember, it’s your kitchen! (Got that from the Next Food Network Star finale last night. Yay Aarti!) I will also be using light or fat-free feta cheese in this recipe but as always feel free to use regular if you wish. This is a great side dish in the summer, it’s simple and not so heavy, and it’s full of protein from the quinoa! All good! So give it a try and as always, let me know if you try it and how it turns out! 1. Rinse the quinoa in a strainer. 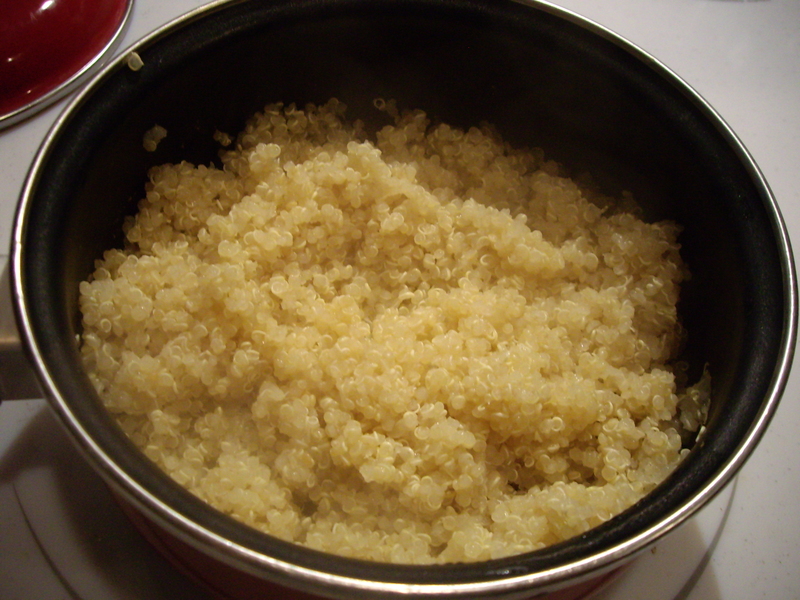 In a small saucepan, add the quinoa and 1 cup of water. Bring to a boil over high heat, then cover and reduce heat to simmer until water is absorbed, about 10-15 minutes. 2. Meanwhile, heat a skillet over medium heat and add the olive oil and garlic. Cook the garlic in the oil until the garlic turns light brown. Be careful not to let it burn.Lower the heat if necessary. 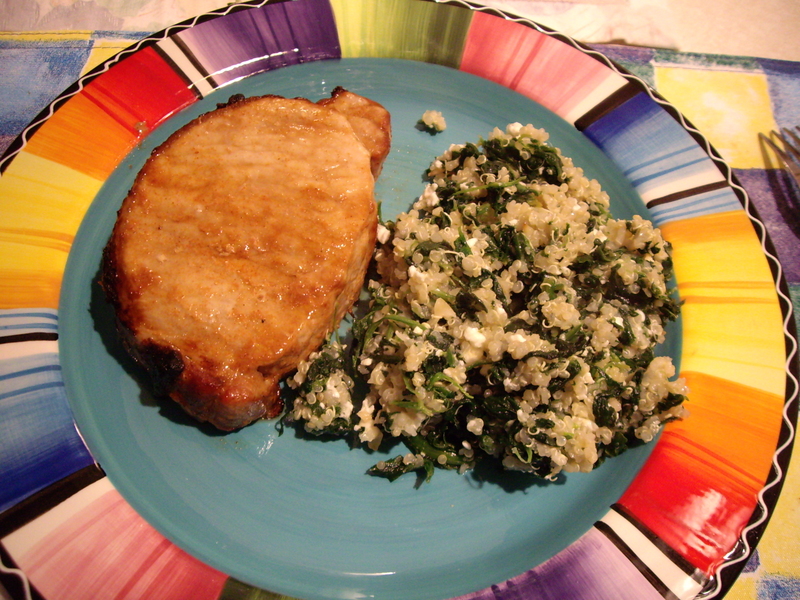 When the quinoa is done cooking add it to the skillet along with the spinach. Stir together until the spinach wilts or is heated through if using frozen. Add the crumbled feta cheese and stir to combine. I found quinoa in the past year and I love it. It’s a good change from rice, couscous, etc. Definitely let us know how this comes out… it sounds great! I plan on making it tonight so we shall see what happens! I will post the results! The verdict is in everyone! I made this last night and needless to say, there are no leftovers! It was so good! Delicious! My husband liked it alot too. I updated the photos on the post with my own. I also used frozen, chopped spinach and it came out fine! So try it everyone! I have to go buy more quinoa!